Imagine an alternate history in which the axis won WWII. The U.S. and the rest of the world has been divided between Japan and Germany and totalitarianism reigns supreme. Germany has carried out their Final Solution world-wide and the Western United States has become dominated by Japanese culture. To be American is to be downtrodden, abused and disrespected but slowly one book begins to introduce the possibility that things could be different. When I began TMHC, I approached it thinking I’d be reading about how laws are different or what conflicts take place or other such macro-level issues in the alternate past. Instead, TMHC paints a surprisingly subtle picture of what life is like under Nazi or Japanese rule. As PKD does so well, we get a sense of the personal turmoil which actually tells more about what the world was like than had it been told the way I expected. And the suffering seems so much more real and worse for it. Even more than I expected macro descriptions, I absolutely expected some kind of political conflict. Of course political conflict was present but the real conflict was the search of a downtrodden American people for an authentic American experience when the dominant culture tells them that the very best of contemporary American culture is a joke to the high class, Japanese elite. In that way, I thought PKD had more to say about the debate over high/low, hierarchical approaches to art and culture than the politics of a victorious Axis Powers. While I normally enjoy that discussion, I wasn’t terribly impressed by anything PKD had to say here. The other converstation taking place dealt with authenticity and in this case, I think PKD just didn’t have anything to contribute to the conversation. I’ll grant that I don’t really know the direction of academic thought on authenticity in the 60’s compared to today, but I’d be willing to bet that this may have been cutting edge the time even though it fell flat for me now. There were very few (probably none) characters that I cared about in TMHC. The one I was most interested in though was Robert Childan, the American artifacts dealer. He has completely internalized the view of the low-class American and his struggle to come to terms with and overcome his doubts was stirring, though a little strange at times. I guess, his motivation was probably my second favorite “character”. Which is to say I loved it when the book took a reflexive, introspective turn and become self-aware – Italo Calvino style. I don’t want to say much about it because I was a bit disappointed by it and don’t want to give away much about the end. But the fact that a book about an alternate WWII outcome which contains a book about an alternate WWII outcome was a bit like being trapped in a house of mirrors for a while…and fun. This week’s book is The Moon is a Harsh Mistress by RAH. I think this is one of the best Heinleins, though I’ve not come close to reading them all. I am really looking forward to it. Also, we’ve got a sure to be major 3-way M of the P contest coming up for the 60’s. Next week’s book is A Canticle for Leibowitz by Walter M. Miller Jr. which I know nothing about, but it sounds like it might be more theological SF, which have been a mixed bag to this point. Eeep! 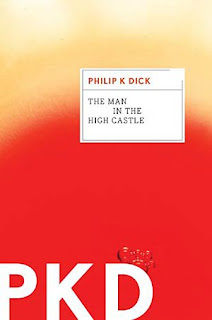 This is the one I usually recommend for PKD newbs (other than his short stories, of course), because it's not as far out there as his other novels are/were. That might have been part of my problem. I've read some PKD before this and was expecting something quite a lot different... I gave it a low score but it was good enough that I need to give this another shot someday. It probably isn't my favourite of his, but I definitely have a difficult time being unbiased where his work is concerned. I really liked your review of TMITHC by PKD. Here's a constructive comment, consider using Grammarly to write your blog. It is free and catches so many little things. Your ideas on this book were insightful. Keep up the good work.